Autumn isn’t usually the season most people begin decorating for Christmas, but it’s a great time to get a head start on all your holiday preparations. Planning your decorations before the holiday rush gives you time to organize materials and avoid last-minute shopping. Here are some ideas for creating a put-together Christmas look. By hanging your Christmas lights early, you’ll be able to test the lights and power sources. You also have more time to select the right length strands to fit each location. Remember: You don’t have to turn on the lights just because you hang them up. With your decorations finished earlier, you can light up your home for Thanksgiving guests or plan a big reveal night at the start of the season. The weather also tends to be milder in October. With less chance for snow and ice, you’ll be safer on ladders and roofs and can enjoy decorating without needing to bundle up. If you’d like to add flair with large or small inflatables, map out the best spot for each figure and plan where you will plug in extension cords. If you’re working a few weeks ahead, you have time to test that your power source and inflatables are working properly. Not a fan of inflatables? Easy-to-use light projectors are the latest trend. Opt for sparkling stars, a snowman, or a holiday saying on the front of your home. Hang a gorgeous wreath on the front door. Battery-powered LED wreaths light up without any dangling cords. Attach fall leaves and wooden pumpkins when you hang it up, then swap them out for red bows and candy canes when Christmas arrives. Place small evergreen trees – real or artificial – in porch pots. They’ll add natural color and life to your porch. During the holidays, decorate them with weather-resistant decor like red bows, artificial birds, and glittery pinecones. Fill a basket with gourds and pumpkins and place it by the front door. As the holidays approach, replace the fall items with wrapped “presents” – a good use of last year’s leftover Christmas wrapping paper and boxes. Simply add a doormat with a holiday motif in place of your usual one. October is the perfect time to begin decorating for Christmas. Plan your decor early this year and you’ll have a stress-free, carefully curated holiday scene. Lea Schneider is a professional organizer who writes for The Home Depot about all things organization, including the best ways to plan for the holidays. 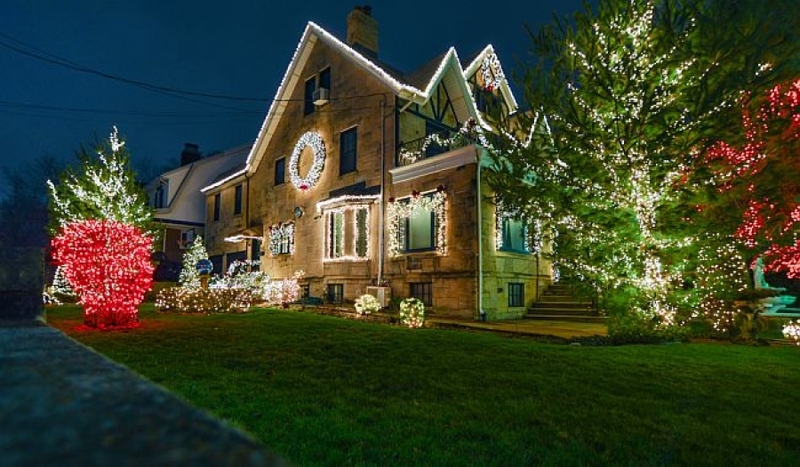 She provides useful tips on using outdoor Christmas decorations to spruce up your home’s curb appeal during the holiday season.